In this post you can see a photo of another bird I found in the mentioned bird station. I saw several signs with explanations of the birds, but I think they had more bird species than signs. So, in this case I can just assume that the bird in the photo is a canary bird. I am sad that I shot the photos in the evening during overcast sky, because I had to use ISO 1600 and that is the reason why the image is so noisy. I didn’t want to use the noise reduction feature in Lightroom too heavily, because it would also blur the image a lot, which means I used it just a little bit. Anyway, I do still think the photo is ok, you clearly see the subject, the bird, and I like that. I can not await springtime, because more sunlight means photography will get a lot easier again. This is a beautiful bird, Dennis! I’ve never seen one like this. Gorgeous. I don’t think I’ve ever seen a canary in real life. Is that what this is? Love the colors! I believe this should be a canary. We usually don’t have them in Germany, but this was some kind of a bird station, they were in big cages in a forest where people can watch them. I saw a lot of signs, but for this bird there was no sign so that I can just assume that it is a canary, because the Google photos would look very similar. Well it looks like a canary to me. I used to have a pet one. Never seen one in the wild. The males have a lovely song, the females are quieter. 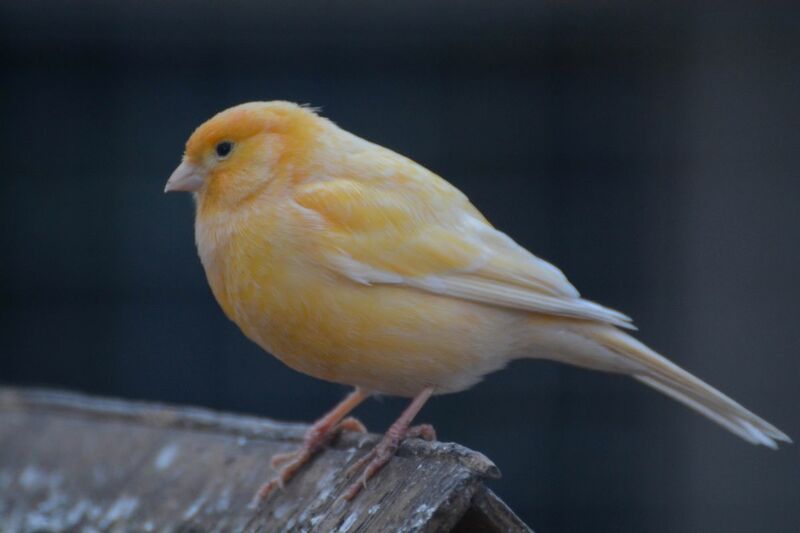 I think too that it is a canary, I compared the photo with other images I found via Google. I don’t know why they didn’t have a sign for the bird in that station. Could it have flown in from somewhere? An escaped pet that knew a good thing when it saw it? Looks like an escapee from a cage. Poor little thing. No, this one was in a big cage together with lots of budgies. I found these big bird cages in a small forest near a path, where people can watch the birds for free. It’s set up by a known German nature union. The thing is, for some reason I can hide the cage grid when I focus on a distanced bird with 300mm…. maybe the field of view gets that small at 300mm that I can hide the cage grid, or it’s just not visible because I am focussed on the bird in the background. No matter what, I like that this is possible with a camera 🙂 In some cases it didn’t work, I believe it has to do with the bird distance or the distance to the grid of the cage.